Luke Goodman Cinematography Blog: Friday night cooking at home: Scallops, Pinot Noir and brownies! Friday night cooking at home: Scallops, Pinot Noir and brownies! Pamela and I stayed in and cooked at home tonight. I felt like playing with the new camera a bit. It was also a good chance to play with the new editing software update for Adobe Premiere. It's proven already to be a great update to an already fantastic piece of software. 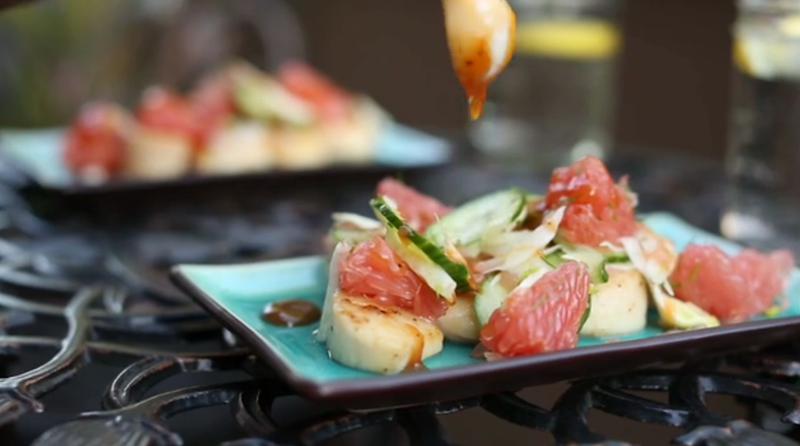 Pamela planned a dinner of fried scallops with fennel, grapefruit and english cucumber. A perfect meal for a warm summer evening. We topped off the evening with pinot noir, brownies and ice cream. Ah...looks sooo delicious!! You are a wonderful chef Pamela, and you too Luke!! Wish I was there, yummy yum!! What a great way to spend a Friday night: make a special meal, delicious dessert and have a great bottle of wine. You two could have your own show I think!! Such a great video "Cooking with Pamela" - looks yummy AND one of fav wines (in fact, I am having a glass now). Any way you can post the recipe - I want to make those scallops!